Create a design and simulate using EE-Sim® tools: The MAX1708 sets a new standard of space savings for high-power, step-up DC-DC conversion. It delivers up to 10W at a fixed (3.3V or 5V) or adjustable (2.5V to 5.5V) output, using an on-chip power MOSFET from a 0.7V to 5V supply. Fixed-frequency PWM operation ensures that the switching noise spectrum is constrained to the 600kHz fundamental and its harmonics, allowing easy postfiltering for noise reduction. External clock synchronization capability allows for even tighter noise spectrum control. Quiescent power consumption is less than 1mW to extend operating time in battery-powered systems. Two control inputs (ONA, active-low ONB) allow simple push-on, push-off control through a single momentary push-button switch, as well as conventional on/off logic control. The MAX1708 also features programmable soft-start and current limit for design flexibility and optimum performance with batteries. The maximum RMS switch current rating is 5A. 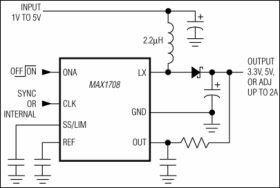 For a device with a higher (10A) switch current rating, refer to the MAX1709 data sheet.